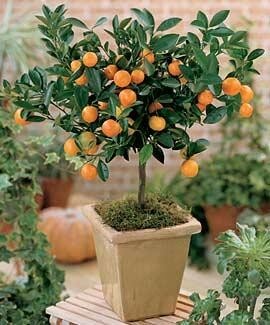 Citris Mitis Calamondin “Minature Orange Tree”-Produces 2" orange which are very tart, similar to a lemon but with milder flavor and a hint of orange. Aside from being an attractive ornamental tree its fruits make excellent preserves and the juice is a great lemon substitute. Mature height is 6' and it may be pruned to a smaller size, great as a Bonsai! A willing indoor grower with bright light. The tree is a heavy producer of fruit and its masses of small white blossoms are intensely fragrant and flowering much of the year. These are not easy to sprout. Once you get them going they will grow like any citrus. Germination rate is low. Please be aware before buying them.